Click Here To See The Published DC Comic Book Ad Promoting Swamp Thing #1! After House of Secrets #92 hit the news stands in late 1971... Swamp-thing instantly became a super hot character, DIRECTLY because of the extremely detailed art by one BERNIE WRIGHTSON! Wrightson and writer Len Wein had resolved to make the character a bit more human. That new look premiered in Swamp Thing #1, which this amazing illustration pre-dates! This piece was penciled, inked, colored, and lettered ALL by Wrightson and was PUBLISHED throughout ALL DC comics in early 1972 to promote SWAMP THING #1 in late 1972! Produced in ink and ink wash over graphite on Bristol board with an image area of 10 by 14 inches, Same size as a cover image (minus logo) on 11 by 17 inch Art board. 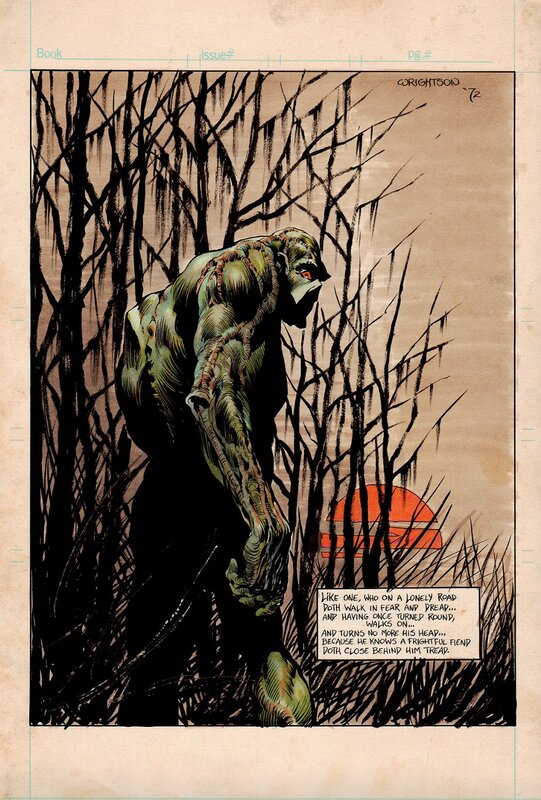 Outside of owning a WRIGHTSON SWAMP-THING COVER, you will NOT find a more amazing..... More historic piece of SWAMP-THING art, created ENTIRELY by the great BERNIE WRIGHTSON, than this masterpiece right here, unless you are spending over 100 thousand dollars for one of Bernie's SWAMP THING COVERS! Compare this art to the PUBLISHED DC Advertising art in the RED LINK ABOVE! ALL art on our website (including this one) are able to be purchased with VERY fair time payments, and trades are always considered towards "ANY" art on our website! Just send us an email to mikeburkey@aol.com and we can try to work something out.